American Airlines Refuses Rachel Barton Pine with del Gesu on Flight from Chicago to N.M.
April 28, 2016, 8:52 AM · Once again, the skies have proved not-so-friendly to those carrying musical instruments on airplanes. 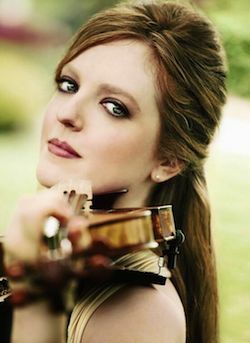 On Wednesday violinist Rachel Barton Pine was denied boarding on her American Airlines evening flight from Chicago O’Hare International Airport to Albuquerque, N.M. because she was carrying her violin, the “ex-Bazzini ex-Soldat” 1742 Joseph Guarneri “del Gesu” violin, on lifetime loan to her from an anonymous patron. Pine was the first passenger down the jet bridge. However, the captain (who would not give his name to Pine) refused to allow her to board the plane with the violin case because “its dimensions were not correct for a carry-on”. Pine flies over 100,000 miles a year with American Airlines and has flown the same plane configuration on numerous occasions, placing the violin case in the overhead compartment. Pine shared with the captain the American Airlines policy stated on their website: "You can travel with small musical instruments as your carry-on item on a first come, first serve basis as long as it: Fits in the overhead bin; or fits under the seat in front of you." Pine is scheduled to perform the Beethoven Violin Concerto with the New Mexico Philharmonic, conducted by Fawzi Haimor on April 30. She was flying the evening of the 27th to attend events the next day with students in the New Mexico Philharmonic’s Young Musician Initiative program as part of her community outreach schedule. According to Pine, agents at the American Airlines ticket counter wereapologetic about the crew’s behavior and worked closely with Pine to rebook her on a flight to Albuquerque that would allow her to honor her commitment to the young musicians. Rather than a direct flight arriving at 10:30 p.m. that evening, Pine took a 5 a.m. flight with a connection through Phoenix the next day. This is not the first time Pine has had this kind of experience; last September her family was forced to spend the night at the Phoenix airport when USAirways refused to let her store the violin in an overhead compartment. "The Department of Transportation and the airlines have established important policies to protect musical instruments," Pine said. "However, those policies are meaningless if they are not enforced or if the airline staff and crews are not properly educated and trained." American Airlines said in a statement that the captain of the flight aboard a regional aircraft operated by Envoy Air "determined that Ms. Barton's instrument could not be safely secured in an overhead bin or under a seat." "Ms. Barton was offered the option of valet checking the item, but declined. She was subsequently rebooked for travel this morning on larger aircraft that were able to accommodate her instrument as a carry-on item," American Airlines spokeswoman Leslie Scott said in the statement." The Captain did NOT 'determine' that my violin wouldn't fit - he wouldn't allow me to demonstrate and even said "it doesn't matter if it fits." April 28, 2016 at 05:07 PM · Well, just another sign of the lack of comman sense in our society. So unfortunate that there are some people who do not realize that you're not going to check your priceless instrument. And if they think you should buy it a seat then they should make all those other passengers with crazy carry on buy one for their stuff, too. Sorry you had to go through that. April 28, 2016 at 05:12 PM · Sounds like a potentially dangerous pilot, like we're not doing the preflight check list "because I say so", maybe because he was under the influence of something. Are those regulations specific for musical instruments really just suggestions without any penalties for ignoring them? April 28, 2016 at 05:32 PM · "The Department of Transportation and the airlines have established important policies to protect musical instruments," Pine said. "However, those policies are meaningless if they are not enforced or if the airline staff and crews are not properly educated and trained. No, Rachel, these are not "policies". Passed by Congress and implemented by the FAA in 14 CFR Part 251. This would never happen on Southwest. Keep that in mind when you make reservations. April 28, 2016 at 06:15 PM · Southwest. The only way to go for service animals and instruments. AA & USAir (same company) are nightmares!! April 28, 2016 at 09:54 PM · The airline industry has been trying to alienate themselves from their customers for some time now, making a trip on one of their cattle cars more and more of a drudgery through the years. What used to be a pleasant experience with professional crews that seemed to enjoy making their customers feel safe and comfortable has deteriorated to a necessary evil, where the clientele have to deal with inferior seating, total lack of refreshments and flight crews who seem to progress the lousy corporate attitude that they are probably stuck with as well. April 28, 2016 at 10:18 PM · @151.42.131.172 -- sounds like SW is definitely the way to go! April 28, 2016 at 11:29 PM · Previous two speakers are correct, the captain is dangerous, imagine him as a crew, that sort of behavior has killed thousands of people, and yes it also is the law for allowing such musical instruments. The captain has abused his authority. It is a,reason to ground him immediate, something that has been done. From another view point, next time we hear a concert, especially by Pine, we should aporeciate what the soloist (s) have to edure beyond the tough life of being a violinist!!! It also goes to show how unbelievable great violinists such as Pine can suffer so much from travel and fatigue and humiliations and still just show up and play better than one can imagine!!!!! If I were the captain, I would see to it that both the Pines and the violin are specially guarded and have ground crew triple check the aircraft and I would go out to check the plane personally!!! It's a good thing the Pines were not on that flight! April 28, 2016 at 11:37 PM · I'm a pilot for American, and on the random chance there's a musician boarding I do my best to say hi, and reiterate 'talk to me!' if there's any question about your instrument. As an aside, if this crewmember was that obnoxious, just think what it's like to be forced to work with them behind a locked cockpit door days on end...it is not pretty! Flying isn't what it used to be. Yes, SWA is known for their customer service and cattle-car ways, but with their happier work place will probably do what they can to accommodate. It shows. April 28, 2016 at 11:43 PM · There was one time in my past i had similar experience but this time with the equipment on the aircraft, I ask the flight attendent to fix it before take off, even with duct tape,they brushed me aside and said they don't have duct tape onboard and if I prefer I could get off the flight. Well, it happens to be an airworthiness item, so I told them I did not mind that at all, but The flight is not going to take off until they fix that, because the aircraft is not airworthy as per the Law. Well the captain showed up immediately at that point while the aircraft was on just sitting by the runway waiting for clearance. By then I have already typed up the report. The captain again told me off, and I showed him the airworthy requirement, which I told him her should have known, and if he did not order it fixed, this flight will be grounded because i will call the FAA and fwd my report immediately. Well duct tape magically appeared and they fixed the problem at my seat, but I told them they r not taking off untill they fix every one! The passangers at first were annoyed by me delaying their flight, but you should have seen their faces when they discovered how serious the problem was, and they ended giving me thumbs up. This rule requires that carriers must allow a passenger to carry into the cabin and stow a small musical instrument, such a violin or a guitar, in a suitable baggage compartment, such as the overhead bin or under the seats in accordance with FAA safety regulations. April 29, 2016 at 04:53 AM · Horrible. do the Captain know the value of a concert and how important it is for the performer to be there on time. April 29, 2016 at 11:32 AM · The problem is differing policies between American Airlines and their affiliate Envoy. The FAA does not allow carry-on bags on Envoy (American Eagle), though they allow personal items. However on American Airlines and some of their other affiliates carry-on bags are allowed. Throw in a captain with no tact and there you have it. April 29, 2016 at 12:51 PM · American will just issue a boilerplate response "Sorry, blah blah blah" and just continue to be asinine. I forgot what airline this was pictured on but there was a guy with his viola strapped in a seat next to him. I guess he paid for it but it flew with him. This pilot in American's case is an a$$. April 29, 2016 at 01:10 PM · American Airlines is the same way with expensive fishing gear, the crew don't know the policy and are draconian and arbitrary - NEVER EVER FLY AMERICAN AIRLINES they are the worst. I even once was refused but they let a woman on with a GUITAR, the case way bigger than my rod case that fits in the overhead. United, on the other hand, has never given me any problems. April 29, 2016 at 02:30 PM · Agree with previous posters on speaking up. It works. I flew mostly during my student years -- before 9/11. Carrying my instrument on board was no hassle. Security was non-intrusive and took about 10 seconds. There’s no going back to those days, although that doesn’t affect me personally now. I don’t fly anymore. Decided that some years before 9/11. Even without my aversion to flying -- despite aviation’s excellent overall safety record -- the annoyances I’ve heard of, though I didn’t experience them firsthand, would be enough to keep me from going back now: long delays; flight cancellations; cramped seating; baggage mix-ups; indifferent crew members -- like the ones Rachel Barton Pine had to deal with; rowdy passengers -- whose behavior has forced some emergency landings. "This rule requires that carriers must allow a passenger to carry into the cabin and stow a small musical instrument, such a violin or a guitar, in a suitable baggage compartment, such as the overhead bin or under the seats in accordance with FAA safety regulations." Sorry, this rule only applies if there is room in the overheads for your case at the time you board the aircraft. If there is no room, you must check your case or take another flight or beg another passenger to make room for your case by checking his/her bag. In my earlier post, I wrote "This would never happen on Southwest." "never" of course sometimes happens. So allow me to redo that claim: It is highly unlikely this would happen on Southwest. As the American pilot says above, it's all about the attitude of the Southwest crews towards the passengers. There are some wonderful crews on other airlines, of course. But there are also many with negative attitudes towards their companies and that sometimes bleeds into their treatment of passengers. I also regret not saying in my first post that I am sorry this happened to Rachel. After all, I am a Wohlfahrt #3 kind of guy, and her Wohlfahrt book/dvd is great! April 29, 2016 at 03:02 PM · Meh. Not really concerned or impressed with the complaint profile. Captain may or may not have been a jerk in how he went about his/her job, but I've been on plenty of flights where the gate crew were threatening to take away appropriately sized carry on bags because the flight was "fully booked," while a number of the passengers on the flight were loading their waaaaay oversized instrument cases into the overhead bins taking up way more space with one item than 3 regular passengers put together. Heck, more than once I've mused that the way to be able to drag more than your fair share of stuff onto the plane as carry on is to stow it in a musical instrument case. April 29, 2016 at 04:10 PM · Sorry folks, but the key to this one is the fact that it was a regional jet. When in comes to the CRJs and ERJs, you'll often find that even your regulation carry-ons are going to have to be valeted at the gate. I wasn't there and neither were you, but rude or not, the captain has the final say. April 29, 2016 at 05:49 PM · I play the violin, for fun not professionally, and I've taken my violin with me when I travel. Most airline folks don't have any issues with me or my fiddle. Only once have I had to pull out the FAA regulation on musical instruments. After I did, there was no further problems. The issue with stringed instruments is that the parts are basically held together with (temperature sensitive) glue. You don't want to expose them to extreme temperatures...especially a priceless violin! April 29, 2016 at 06:14 PM · Just another pilot with "small hands" compensating for his inadequacy. April 29, 2016 at 06:17 PM · Nice weasel words in the airline's statement, referring to "her instrument" when they might have said "her violin." "Instrument" could have been a cello, a bass, a set of bagpipes, etc., and I won't even bring up Lilly Tomlin. April 29, 2016 at 06:33 PM · Bad business to treat a customer in such a manner. I have never experienced this on United. But since I am not a concert violinist I have stopped taking my $3000. instrument on my weeklong trips to Texas from Colorado. Were it my airline, this American pilot would be in basic training. Unhappy customers can and will put them out of business. April 29, 2016 at 06:40 PM · Bad customer relations, any way you cut it. I would not fly American. I have never experienced such treatment with United. The pilot should be sent to a customer relations seminar before being allowed back in his captain's chair. April 29, 2016 at 08:57 PM · I was on AA traveling to London on a Jumbo Jet. There was a line in Coach for restrooms. An old lady using a cane tried to go forward to use one in business class only to have the flight attendant mercilessly send her back to coach with a firm admonition while pointing the way. AA is the worst. April 29, 2016 at 09:41 PM · You expect someone to gate check a violin that is literally priceless? Other violins made by the same person of similar vintage have sold for 8 figure prices, that is over ten million dollars. It would be utterly insane to hand that off to a baggage handler, and it would be just as insane for the baggage handler to accept that item. The violin could be half the value of the entire jet plane, or more. April 30, 2016 at 12:14 AM · Maybe it's worth taking some sort of hidden recording device with you on such a flight, so that it can be proved, when you complain to the airline, that the captain said what he did say. April 30, 2016 at 03:00 AM · What is wrong with this pilot? April 30, 2016 at 05:44 AM · There's always Megabus. Lots of tokin goin on in the back. After the bad publicity, AA reluctantly paid up. Good thing it wasn't a Del Gesu. Air Canada seems to be getting it right lately. I get nervous, though, every time I fly with my violin. Canadian regulations about musical instruments are pretty well the same as U.S.
April 30, 2016 at 07:42 AM · As the recent Air Canada and Norwegian Air issue back-tracks after public pressure demonstrate, we can do something: re-post, share, re-tweet, and promise BOYCOTT! April 30, 2016 at 03:32 PM · How regularly (if at all) does American monitor its pilots for alcohol consumption, i.e. for flying drunk or hung over? 1) Megabus: Numerous trips have been made between Los Angeles and San Francisco by our cellist son within the last 3 years and he has always purchased a seat for his cello. Usually this arrangement works smoothly, but once one of the drivers did NOT allow the cello to occupy its paid-for seat and the cello had to ride in the cargo hold underneath the bus. Fortunately, the cello endured the trip with no problem. Smaller instruments may of course be easier to manage, but for Megabus, the bottom line is still at the discretion of the individual bus driver. 2) United & Delta Flights: No problems for me flying on United multiple times with my violin. I have been paying extra for early boarding privileges to help ensure a space for it (my violin is well over 200 years old) in the overhead compartment. On Delta, I arranged a high school string orchestra trip from L.A. to Atlanta for an ASTA conference. We flew over 40 students there, with a majority of them carrying their violins and violas (cellos and basses were borrowed in Atlanta). We didn't have a problem on either the outgoing and return flights ... we asked to board early and each instrument was fit into the overhead compartment. Perhaps we got really lucky! 3) Air Canada: Recent travel on Air Canada (Feb 2016) was outstanding. Same cellist son purchased a seat for his cello and the price was 1/2 the lowest available priced ticket! He was told that he and his cello would "board early" (i.e., along with passengers needing extra assistance). The Air Canada flight attendants were very helpful. I believe in one leg of his trip, an attendant took the cello and installed it in its seat (they even threw a safety net over the cello after securing it) before our son was allowed to enter the plane. There may have been a few moments of separation anxiety there, but everything was handled very satisfactorily. For his three separate A.C flights, it seemed like he and his cello received special VIP treatment! This excellent treatment is an indication that AC is adopting a very friendly and accommodating attitude for flying musical instruments. April 30, 2016 at 05:40 PM · It would be enlightening for the Captain to read the Sermon on the Mount: "do not cast pearls to swine." April 30, 2016 at 09:29 PM · The American Airlines statement regarding the incident is misleading, at best. The American Airlines agents and representatives at the O’Hare ticket counter were exceptionally helpful in rebooking me. However, the only consideration was my arrival in Albuquerque in time for my obligations. The size of the aircraft was never an issue. The first leg of my flight was a 737, which is significantly larger than the CRJ-700 on which I was originally booked. The connecting flight from Phoenix to Albuquerque was a CRJ-900, which is only slightly larger than the CRJ-700. I have flown both CRJ configurations, storing my instrument in the overhead, on many occasions in the past. A photo of my violin in the overhead of the CRJ-900 can be seen on my Instagram account. My violin case would have fit without any problem into the overhead of my original flight (incidentally, its dimensions are 32.5 x 11.25 x 6.75 and the dimensions of the CRJ-700 overhead bins are 52.5 x 14 x 9.5 according to the American Airlines website). Thank you to those who have suggested purchasing a seat for my violin rather than using the overhead bin. The federal law and the American Airlines policy recognize that the safest place for a small instrument like a violin or a guitar is in the closet, in an overhead bin, or under a seat. I suspect that these rules exist for both the safety of the instrument and the safety of other passengers. A violin case would be even more difficult to secure in an airplane seat than a rollerboard suitcase and could dislodge and injure someone in an emergency situation. It is important to remember that American Airlines is not the issue – this happens on other airlines. This issue also extends beyond me – this kind of thing happens far too often to other musicians traveling with their instruments. And the issue is definitely not the value of the violin – a $50 violin is just as breakable as the antique violin which I borrow. The issue is the awareness of and adherence to Federal laws and airline polices established to ensure the safe transport of musical instruments on airplanes. Employees of all airlines must be educated about these policies and must abide by them. May 1, 2016 at 01:44 AM · What a dope. Amarican airlines should have offered a real apology, not a backhanded one. The pilot should be bumped off his next flight home and if he likes it. May 2, 2016 at 01:04 AM · As a last resort, on the bigger,international flights at least,there is space for a violin case behind the last row of seats and the wall behind it. A steward took one look at my violin case on a packed flight and just motioned to the space. I've used a few times since, it seems to work fine in a pinch. I've never tried this on a smaller plane yet though.